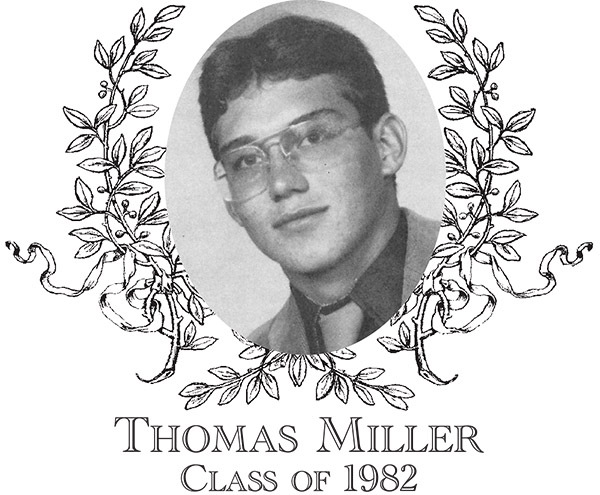 Thomas Miller, Class of 1982, was a three-sport athlete playing football, basketball, and baseball. Tom was a natural leader with his grit, determination, and intensity being infectious. Despite receiving many accolades in the press, he remained humble and was all about his teams. Tom played football his sophomore, junior, and senior years. Tom was an outstanding quarterback, known for his passing and running abilities, during his junior and senior years. Tom was also a talented punter and defender. As a junior, Tom started the season strong, on pace for one thousand passing yards, and making key runs including a 60-yard game winning run. Tom would suffer a serious ankle injury, causing him to be sidelined for several games. Tom returned on Thanksgiving, passing for over 120 yards and leading the Indians to an emotional 14-8 win as the team mourned the recent loss of their head coach, Jim Healy. Tom was named the Sabatinelli MVP, the first Thanksgiving Day win for the Indians in 11 years. During his senior year, Tom's outstanding offensive play continued, passing for over 1,000 yards and 15 touchdowns while also providing key rushing yards throughout the season. On defense, he was a ferocious tackler and led the team in interceptions. The Thanksgiving Day game was another highlight of his career as he threw for 180 yards, two touchdowns, and defensively intercepted the ball a record setting three times. Tom was again named the MVP of the game, becoming only the second player at that time to win the award twice. Tom was selected as a Border Conference All-Star in his senior year. Tom was a two-year starter on the baseball team. He played shortstop and third base and was a leading hitter for the team. Tom was named team MVP his junior year and was a Captain his senior year. Tom also played varsity basketball his senior year, specializing on the defensive end of the court. Tom was awarded the District E Athletic Directors' Award for his outstanding athletic achievements during his senior year. Following high school, Tom proudly served in the Marine Corps attaining the rank of E-4. Tom also coached the Dudley Little League Softball team to the State Championship. Tom lives in Dudley with his wife Kelli, has four daughters Ashley, Bethany, Kristyn, and Rachel, and five grandchildren. He is a District Manager for SEI/Aarons.